America’s Most Beloved Ballpark is uniquely nestled in the city of Boston. Fenway Park is a place where dreams are made, traditions are celebrated and baseball is forever. See the home of Red Sox Legends, Williams, Yaz, Fisk and Rice. Visit Pesky’s Pole and sit atop the world famous Green Monster which stands 37 feet 2 inches high overlooking left field. 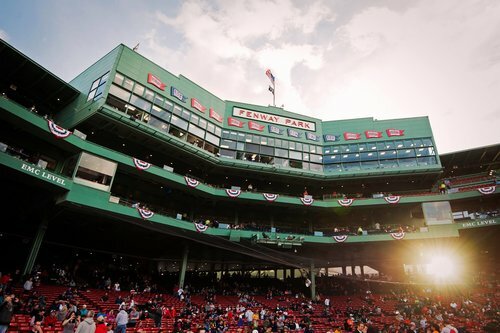 Our experienced tour guides will provide a thrilling, one hour, walking tour of Fenway Park. We welcome all fans to Fenway Park, home of the Boston Red Sox and the pulse of Red Sox Nation. Group Rates: In addition to the listed rates below, School and Camp discounts are available. Please call (617) 226-6839 for more information and to reserve your time slot now! Food: Available for groups only. Several restaurants may also be found near Fenway Park. Gift Shop: All tours begin in the Red Sox Team Store located on Yawkey Way, directly across from Fenway Park. The Team Store closes at 5:00 PM (pending holiday and game schedule). Accessibility: Fenway Park is proud to be accessible. Wheelchairs are available for the tour on request. Hearing impaired and language interpreters are available with advanced notice. Parking Info: Free and metered parking available on a first come, first serve basis. Chaperone Policy: Minimum 4 chaperones per student group.